I'll start out by saying that I completely forgot about the anniversary of the site this year so I've been scrambling today to come up with something interesting. I think I found something that people will enjoy and I'm actually surprised that I didn't post it sooner. Before I get to the post I wanted to thank everyone who checks the site, hits me up in comments, emails, and requests....and as always a massive special thanks goes out to anyone whose hooked me up with music over the last 5 years. I haven't seen this posted anywhere so I'm hoping this is the first time it's shown up on the internet. I received this show footage in a trade back in the day and I have no idea who it came from. This footage was filmed at the El Ray Theater in LA at some point in 2000 and for an amateur filmed concert the quality is surprisingly good. I don't know anything else about the show but the lineup of artists is crazy and based on the hour and forty minutes of footage it would have been an amazing show to see live. Based on some of the other artists hanging around it is likely there were other performance this night that aren't in this video. If anyone has more footage from this show or other shows like it please hit me up, I'd love to rip it and get it on the site. This footage features performances by: Circus, Awol One, Xololanxinco, Kirby Dominant, Sage Francis, Dose One, Sole, Jel, Basik MC, L.A Symphony, Josh Koslow, Elusive, Joe Dub, Subtitle, and Megabusive. 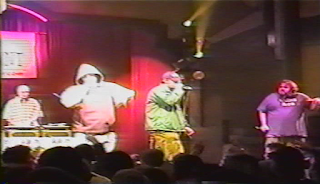 Indy Fest 2000 Featuring: Circus, Awol, Sole, Dose One, Sage Francis, Jel, Kirby Dominant, Basik, Joe Dub, Subtitle from Jibs on Vimeo.